Five people find themselves separated from the others in a party touring some ancient catacombs. They realize they are lost when suddenly a mysterious door opens and they find themselves in a large chamber with a throne-like stone chair. Their fear becomes terror when a scream introduces a strange cowled Crypt Keeper (Sir Ralph Richardson) who ignores their questions, but invites them to be seated. The first to protest their confinement is Joanne Clayton (Joan Collins). In her saga she is seen to murder her husband on Christmas eve, only to become herself a victim of another holiday murderer in the grisly disguise of Santa Claus. The Crypt Keeper's next tale is about Maitland (Ian Hendry). In the story, Maitland deserts his wife and family for another woman, only to find one of his most horrible nightmares suddenly turned to reality. and we also see Grimsdyke's hideous posthumous revenge. 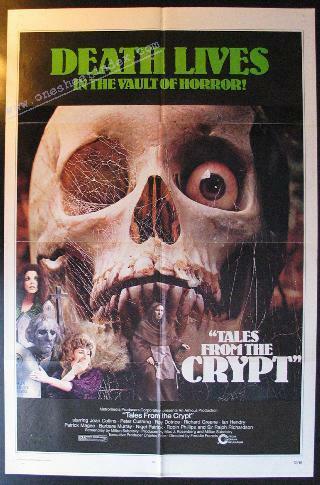 The Crypt Keeper next tells a tale of Ralph Jason (Richard Greene). In a bizarre parody of " The Monkey's Paw", Jason and his wife Enid (Barbara Murray) waste three magic wishes and in their search for health and wealth, find instead insanity and eternal torment. William Rogers (Nigel Patrick) is the subject of the Crypt Keeper's final tale. He takes terrible advantage of his position as superintendant for a home for the blind. The patients, led by George Carter (Patrick Magee) eventually make him pay for his cruelty in an appropriately cruel and diabolical manner. A stone door behind the Crypt Keeper opens slowly and he quietly tells the five people to leave. When questioned as to exactly where they are, the Crypt Keeper informs them that this is the place where people go when they have died without repentance.